Portable structures are very popular for all sorts of events. It can be sporting events, exhibitions or even public events. In this case the governing body of Puebla needed a tent they could take across the state to help out the community. 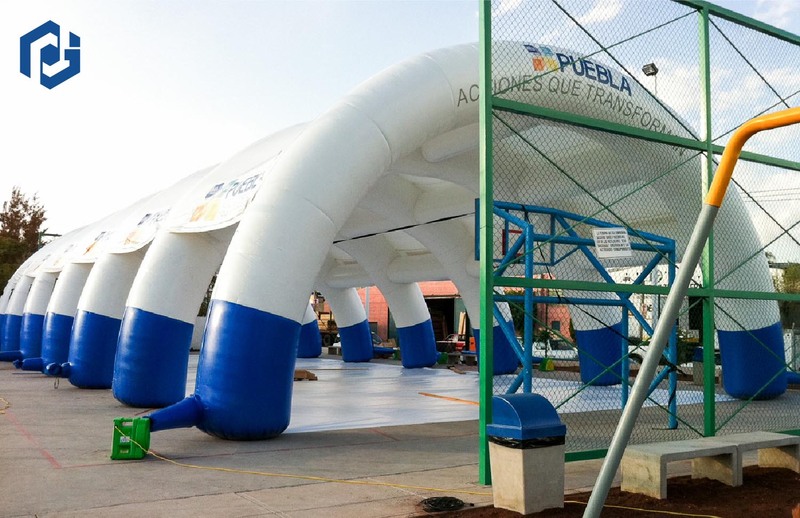 This large inflatable tunnel for Puebla was custom made with both a custom size and customized printing. Their slogan reads "Puebla- Actions That Transform." Their constituents would suggest improvements for the government and at the same time the government would provide social workshops out of the inflatable tunnel. It was made for the government to get more personal with their constituents and to speak to them directly in a peaceful way. With this large inflatable tunnel they were able to go to multiple places without having to waste a lot of time and without having to assemble a great many parts with heavy duty hardware of any sort. The tunnel just needs to be plugged in, tied down and then it is ready to use. An inflatable structure is easy to use as it only consist of one unit that needs to have 1 or more air blowers attached, so the setup takes minutes. When it is not being used it can be bundled up into a small package. The best part about it is that there is no need for tools of any sort. It comes with everything needed attached to it and it is very easy to install. A modular structure on the other hand takes a lot of time, tools and transporting them is a hassle. They do not bundle up into one neat pack, rather, all of the panels needed to assemble the structure have to be towed every time and lets not talk about losing a panel or section of the modular system that might be important. We truly believe that an inflatable is easier to use and it is user friendly because it doesn't take hours to configure or install. The other benefit of an inflatable is that it can be customized to look the way you want it to. You can choose to have logos, signage and even patterns all over it and we can print them anywhere and as big as you want it on the inflatable tunnel. The other benefit of the customization is that you are not limited to a single color or two, rather, you can print unlimited colors on the entire inflatable. The sheer scale of the inflatable tunnel is amazing. It was one of the larger inflatable structures we have manufactured. It measured 23 feet in height to give the tunnel a ~46 foot width. Its elongated section was made to measure 93 feet. It is a continuous air inflatable which means that it has to be plugged into a power source during its use. The entire inflatable packs into a large bag and the blower systems pack separately. The final size of the bag it bundles into is about 4 cubic feet in size and it is rather small for the structure which it turns into. This structure is massive and even though it is very large it can be completely installed in a matter of minutes. With a small group of people you can get the whole tunnel installed, secured and ready to use in about 30 mins. We showcase some of our favorite inflatables in the video below. Custom projects have a special place in our hearts because we love working on projects that have never been done before. They test our skills and we love being able to prove that we have what it takes to create them. As a matter of fact, we take great pride in every project we have ever worked on because we truly love what we do. We can work with you regardless of where you are located. This project needed to be manufactured and shipped to Puebla, Mexico and that's exactly what we did. We have worked with projects headed to all parts of the world for movies, large-scale events and even mom and pop shops outside of the U.S.
Our staff is ready to help you out, just give us a call or send us an email. We are ready to work with you on any custom inflatable or any of the other marketing materials in our catalog. When you work with us, we designate one of our in-house designers to your project. Our designers then create a three-dimensional mockup for you to have a clear understanding of how the final project will look. We then work hand in hand with you until you are satisfied with the mockup. If you need a specific color, or if you want to change the size on a logo, or even if you want to do a complete redesign, we will work with you until it is just the way you want it. Our regular turnaround time on inflatables is 2-3 weeks but should you need something sooner, we can do it.